2. Air-oared airship ~ 1905. Airship build by Captain Thomas C. Baldwin was flown by l. Guy Mecklem for balwin at Washington Gardens (commonly known as Chutes Park)Los Angelas. Propelled by two air-oares operated by the pilot who “rowed” the airshio throught the air. Note inflatation valve at the aft end of the airbag. source: http://www.earlyaviator.com/ note; at this site one can find a most wonderfull early airships and captive balloon collection. 1.COPYWRIGHT_FOTOT_PAOLO_OGGIONI_FEst:The Upside-Down balloon from Festo appears at first glance to be standing on its head. In actual fact, there is a concealed cabin on the underside and a further dummy cabin on the top. The engineers of the manufacturing company Cameron Balloons worked with great enthusiasm to produce this “special shape” balloon, which is unique throughout the world. 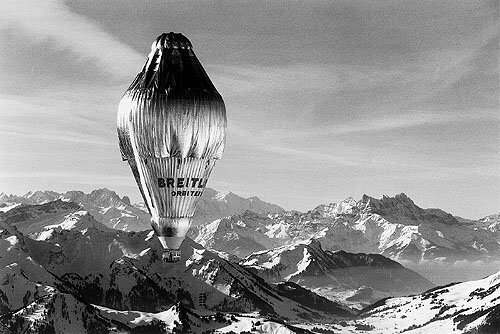 Breitling Orbiter 3 was the first balloon to fly around the world non-stop, piloted by Bertrand Piccard and Brian Jones. Designed and built by Cameron Balloons, of Bristol, England, Breitling Orbiter 3 stood 55 m (180 ft) tall when fully inflated. The propane gas that fueled the six burners was contained in 28 titanium cylinders mounted in two rows along the sides of the gondola. Concerned about fuel consumption, the team added four additional propane containers prior to take-off; these additional four tanks would be needed to complete the trip. In 1995, Graham Dorrington flew a helium-filled airship “Dirigible-4” over Borneo's tropical rain forest. The dirigible was especially designed to have low noise to minimize wildlife disturbance and hence was powered by electric motors rather than using a noisy internal combustion engine. It was flown successfully thirty times and used usefully to collect pollinating insects as well as to count orang-utan nests in a forest area of about one square kilometer. These pioneering efforts proved that controlled movement close to the forest canopy is in fact viable. On its penultimate flight the dirigible was soft-landed atop a flowering Merbau tree and rested there for twenty minutes, further demonstrating the effectiveness of similar platforms for canopy research. 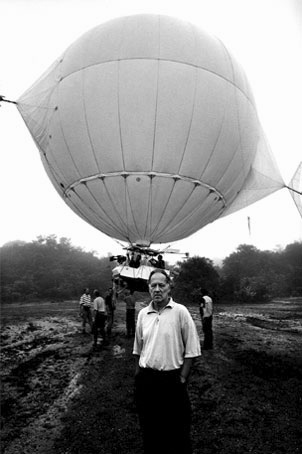 In 2004, Dorrington flew another electric powered dirigible (with a helium capacity of 480 cubic metres and powered by a state-of-the-art rechargable lithium battery) over the Kaieteur National Park, Guyana, while filming the documentary “The White Diamond” by Werner Herzog, 2004. 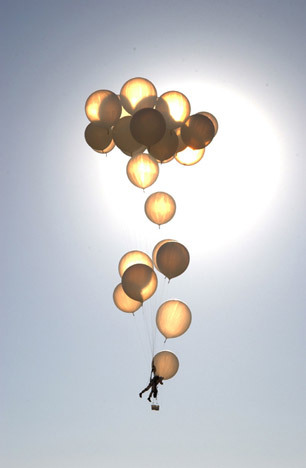 Herzog filmed aswell the Nasa balloon project above in his documentary; Encounters at the end of the World, 2007.